This historic landmark was displaying signs of severe degradation in many of its masonry elements. The PL:BECS evaluation pointed out particularly seismically vulnerable elements, many of which collapsed and required repairs following Seattle’s 2001 Nisqually earthquake. Corrosion of embedded reinforcing caused widespread damage to many pre-cast concrete elements. PL:BECS provided detailed recommendations for restoring long-term integrity. 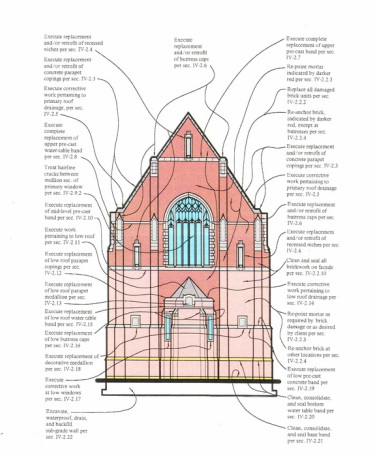 Project Summary:	This early 20th century historic church is a highly visible landmark in Seattle’s University District. The building’s structure consists of multi-wythe load-bearing walls highlighted with pre-cast concrete and sandstone elements, in combination with concrete-encased steel columns supporting a slate-covered, steel-trussed roof structure. Through a combination of improper materials and detailing, and poorly-conceived geometries, the building had begun displaying numerous severe signs of degradation. PL:BECS Services:	PL:BECS provided services on this project in three distinct phases. Initial services included a detailed visual inspection of the building’s entire exterior to identify elements which had degraded to the point where they posed a potential safety hazard. PL:BECS identified and located such hazards on all building elevations, and provided recommendations for needed safety measures. 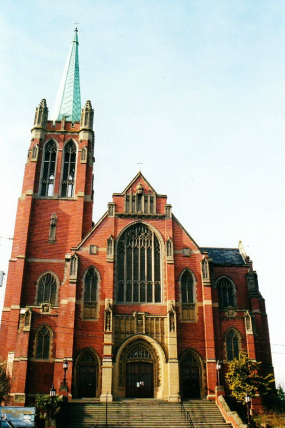 PL:BECS subsequently performed a detailed evaluation of the building’s south transept and nearby areas to identify major flaws and provide corrective recommendations to restore long-term integrity. This study uncovered a variety of significant problems. Of greatest concern was widespread and pronounced destruction of many pre-cast concrete elements resulting from corrosive expansion of embedded steel reinforcing. 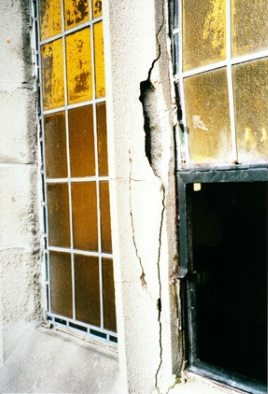 Additional notable problems included extensive leakage into the masonry walls through ill-conceived built-in roof gutters, spalling of brick and exfoliation of sandstone elements, corrosion of veneer ties, inadequate securement of pre-cast concrete elements, and degradation of sub-grade brick walls. This report analyzed 22 different elements, and cautioned about the potential seismic vulnerability of some of these, posing safety risks. As if by prior arrangement, the third phase of services was triggered by Seattle’s largest earthquake in four decades, which came on 2/28/01, only six weeks following the publication of the PL:BECS report. In order to determine the insurer’s responsibility for addressing seismically-related damage, PL:BECS performed a detailed evaluation of the building following the earthquake. This revealed that precisely the previously-identified seismically vulnerable areas had suffered the greatest damage. The preceding, highly-detailed PL:BECS reports were used to greatly facilitate the identification of newly-formed seismic damage.